Rock art can be used in many ways by Indigenous groups - as an affirmation of their cultural identity in Native Title and as a sustainable focus for cultural tourism. The Centre’s research activities are governed by UWA’s Code of Ethical Conduct as well as respecting Indigenous cultural protocols. The Centre for Rock Art Research + Management researchers have extensive experience working in collaborative, partnership-based research projects with Indigenous communities around Australia and abroad. Of critical importance to their success is a well-developed understanding and awareness of cultural protocols, ethics, and sensitivities in dealing with Indigenous cultural heritage. In creating a socially acceptable working environment, Centre staff engage in ongoing community consultation and negotiation and are recognised internationally through publication and conference presentations on their approaches to working with Indigenous communities. 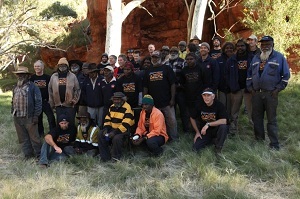 Our archaeologists work closely with Indigenous community groups such as Native Title and Indigenous Ranger organisations through training and education initiatives, as well as innovative results reporting methods including web-enabled data bases, 3D site visits and community posters and plain-English reporting. Male Martu traditional owners, researchers and team members. Canning Stock Route Project 2010. 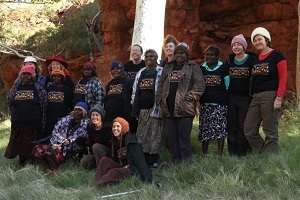 Female Martu traditional owners, and researchers, Canning Stock Route Project 2010.